Shopify stores come with a page creation tool, which is used to produce pages containing information that rarely changes and that customers will use often, such as an About page or a Contact page. From your Shopify admin, navigate to Online store > Pages. Click the Add page button. Enter the Title and Content in the space provided, as well as set the Visibility and select a Page template. 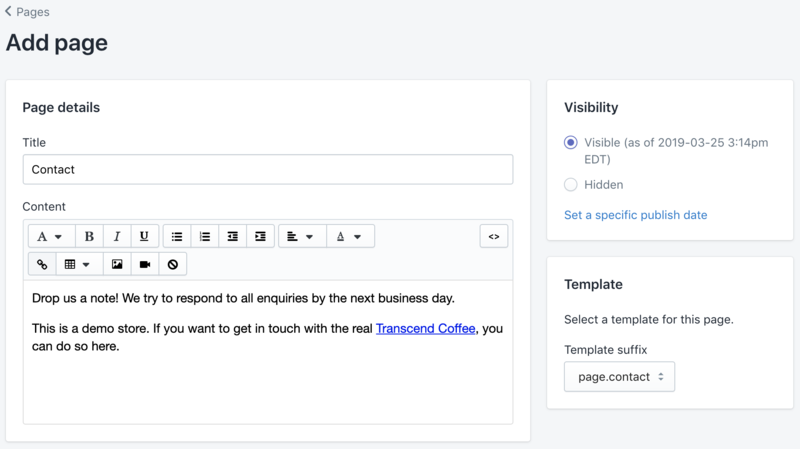 Pacific comes with two templates: a general page template and a Contact page template. By default any new page you create will be the general page template. 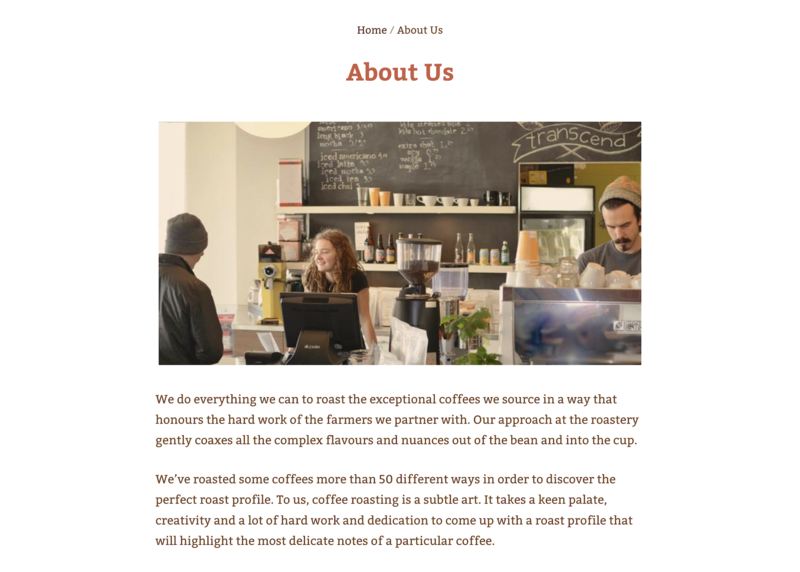 Adding a Contact page to your store is an effective way to communicate with your customers. Create a new page, then look to the bottom right side of the screen for the Templates selector. Select page.contact from the Template drop-down menu. 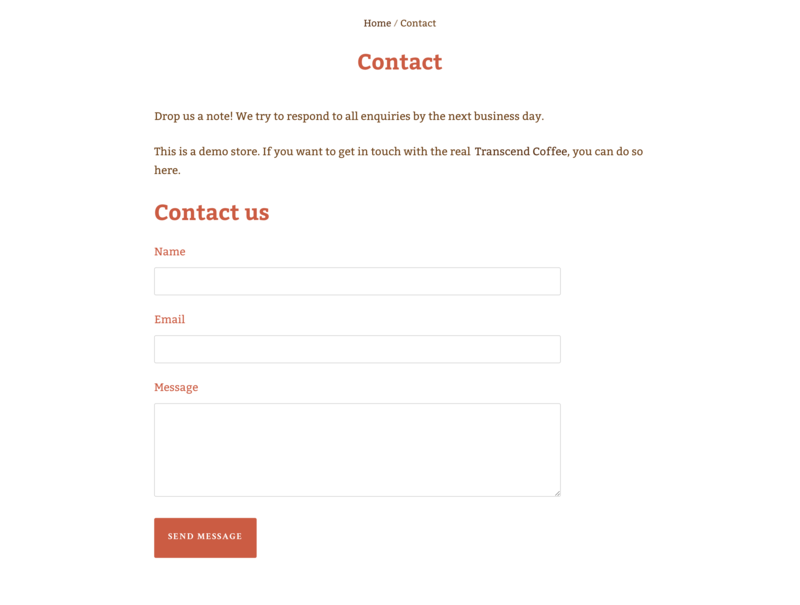 By selecting this template, a contact form will be added to the page's content, including a field for Name, Email, and Message. These field titles can be modified in the Edit languages settings (Online store > Actions > Edit languages > General > Contact page). Add a Title, then any additional text, image, or video to the page's Content field. Another static page that can be customized in the Pacific theme, the Cart page shows a summary of the items added to the cart and a total of how much it will cost them. This page is the last stage of the purchase process before Shopify's secure checkout. Pacific also includes optional features for order notes and shipping rate calculation. To configure settings for Pacific's Cart page, go to the theme editor, then open the cart by selecting the Cart icon or choosing Cart from the page selector dropdown. Tip: To get the best sense of the cart features, add an item to the cart before opening the cart page in the editor. Show lock icon on checkout button will add a small icon to the Checkout button. Enabling Order notes will include a text field for customers to add Special instructions (this title can be changed through the Edit languages settings). The text included here will be added to the order details. Pacific also includes a Shipping rate calculator, a tool that automatically fetches shipping rates on the Cart page for customers to estimate their shipping fees before checkout. Click Enable to activate it, then enter a Default country. Customers enter their Country, State/Province, then Postal code to calculate. If a customer is logged in to their account, their country will be selected by default.